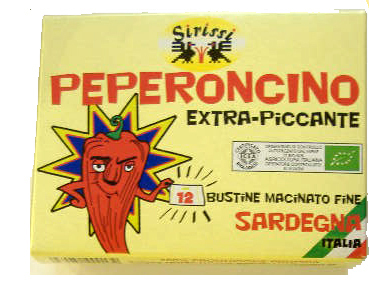 A chilli pepper cultivated and processed in Turri, Sardinia. The Sirissi extra-hot chilli pepper is supplied in practical stay-fresh packets that retain all the original properties of the chilli. Within the re-closable box, you will find 12 individual servings for use in the home, when dining with friends or even in a restaurant. Painstaking grinding, meticulous selection and decades of experience combine to guarantee the high quality of this product. Contains no colourants or preservatives.Try it on bruschetta, on meat or fish, in pastas and risottos or in just about any other dish. Each packet contains a serving for 1-2. This product can be stored for at least two years.